Amazon Super Value Day is live now and this is the best time to shop for groceries and household supplies as you get products at great discounts + upto Rs 1200 cashback. Not only this, there would be also be crazy deals starting at 10 AM. Amazon is also conducting a small quiz to know how well you are aware of the terms and conditions of Super Value Days offer. Answer 5 simple questions and you can get a chance to win Rs 1000 pay balance for free. A total of 100 winners are to be announced. Hurry up and take part now.
" 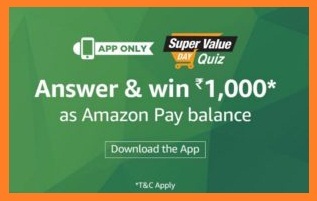 How to win Rs 1000 pay balance from amazon super value day quiz ? Shopping on Super Value Day gives you cashback on purchase of household supplies and more. What is the maximum cashback one can avail? Super Value Days occur on which days of the month? Which of the following would not be eligible for the Super Value Day cashback offer? Customers of which bank’s credit or debit cards are eligible for the additional cashback on shopping from Super Value Days? What is the maximum cashback you are eligible for if you shop for Rs 3000 from Super Value Day store today? A user can participate by navigating to the page where 5 (five) questions will be posted during the entire Contest Period. 0 Response to "Amazon Super Value Day Quiz – Get chance to win Rs 1000 pay balance"